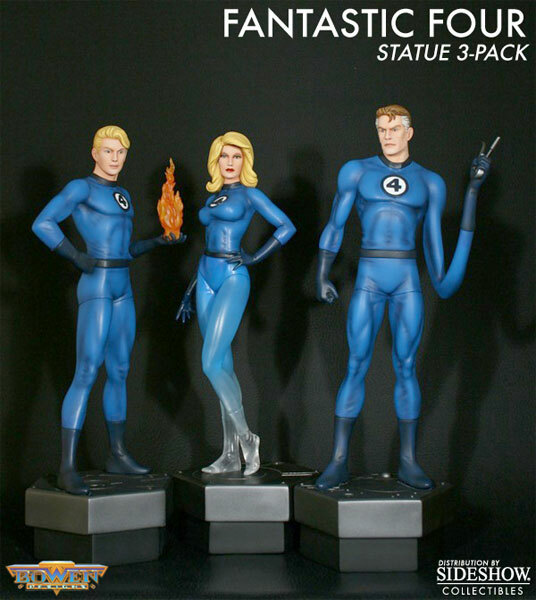 Pre-order the Fantastic Four 3-Pack — featuring the Human Torch, Invisible Woman and Mister Fantastic — from Sideshow Collectibles today! First appearing in Fantastic Four #1 (1961), Mister Fantastic (Reed Richards), Invisible Woman (Sue Storm) and the Human Torch (Johnny Storm) have been the flagship characters of the Marvel Universe. Where’s the Thing (Ben Grimm) you ask? He’s here, ready to stand alongside his family of heroes. These fantastic Bowen Design statues are sculpted by Mike Cusanelli, and each figure stands just over 12″ tall. Climb aboard the Fantasicar and fly over to Sideshow Collectibles to pre-order the Fantastic Four 3-Pack today!